This book caught me off guard with how good it was. I'll admit, though the cover and the word "Prince" are what caught my attention, I really didn't have high expectations for it. I'm happy to say, I was proven very wrong. Nielsen's writing style was simplistic, yet engaging, and even though there wasn't a lot of action, the plot didn't drag to the point where I had to stop reading or anything. I actually couldn't stop reading! 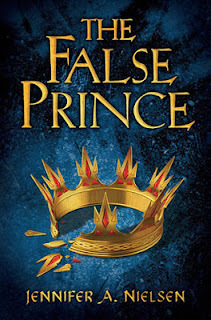 The False Prince was all about intrigue and less about swashbuckling action and adventure. Yes, there was some short (very short) action scenes, but the mystery and scandal are what carried this book. In most cases, this would annoy me to no end. I mean, what's a fantasy book without the adventure? But in this instance, the suspense as to the outcome of Conner's plan was almost too much to bear, and I forgot they weren't really doing much of anything. Although I loved Sage's character, he drove me crazy sometimes. He was just so hard-headed and defiant and sometimes I wished he would just bow down and shut up. But I also respected his character for his mutinous attitude towards everything. He wasn't afraid to ask questions and if the answers weren't to his liking, he found different questions to ask or he sought out new answers. He was a trickster and a thief, and those had to be his most fun qualities to see explored throughout the story. Overall, he was a great main character who I became completely invested in, and actually came to care about. The other characters like Conner (the "villain"), Tobias and Roden (the other orphans), and Mott (Conner's servant), were all good supporting characters, but I didn't like any of them as much as Sage. The last third of this book was like WOAH. There is a plot twist that I didn't see coming and was psyched up about when it did. It was brilliantly integrated into the story, and looking back, there were tiny clues (very tiny) and things that happened that alluded to this outcome. But you won't notice any of them until you're already getting slapped in the face with the truth! I adored this book and read it in like a day. I can't wait to get my hands on The Runaway King (Ascendence Trilogy #2) because I've heard some great things about it. Definitely a fan of this trilogy and I'm excited to see how it all ends! Whee! Diantha!! Just discovered your book corner!! Love it, it's so much better than our blog. Anyway... Totally agree with you on the characters. Sage was overthetop with arrogance which was amusing, but totally out of control. Warning: he gets worse in The Runaway King. It's quite amusing, yet extremely scary for the poor people who care about him. Love your review! Took the words right out of my mouth. Two words. Pudgy Panda. Gotta love those pudgy pandas and you've got them all over your blog. The YA Novelties blog is darling :) But thanks for swinging by and following! ARGH! Sage is worse?! I can't imagine. Still, can't wait to read it!